Cost structure refers to the various types of expenses a business incurs, and it is typically composed of fixed and variable costsFixed and Variable CostsFixed and variable costs are important in management accounting and financial analysis. Fixed costs do not change with increases/decreases in units of production volume, while variable costs are solely dependent on the volume of units of production. This guide teaches an analyst the fixed vs variable cost methods. Fixed costs are costs that remain unchanged regardless of the amount of output a company produces, while variable costs change with production volume. Operating a business must incur some kind of costs, whether it is a retail business or service provider. Cost structures differ between retailers and service providers, thus the expense accounts appearing on a financial statementThree Financial StatementsThe three financial statements are the income statement, the balance sheet, and the statement of cash flows. These three core statements are intricately linked to each other and this guide will explain how they all fit together. By following the steps below you'll be able to connect the three statements on your own. depend on the cost objects, such as a product, service, project, customer, or business activity. Even within a company, cost structure may vary between product lines, divisions or business units, due to the distinct types of activities they perform. Fixed costs are incurred regularly and unlikely to fluctuate over time. Examples of fixed costs are overhead costs such as rent, interest expenses, property taxes and depreciationDepreciation ExpenseDepreciation expense is used to reduce the value of plant, property, and equipment to match its use, and wear and tear over time. Depreciation expense is used to better match the expense of a long-term asset to the revenue it generates. of fixed assets. One special example of fixed cost is direct labor cost. While direct labor cost tends to vary in the number of hours an employee works, it still tends to be relatively stable and can be counted as fixed costs if a worker’s annual salary is not conditional on the number of work hours. Variable costs are expenses that vary with production output. Examples of variable costs include direct labor costs, direct material costCost of Goods Manufactured (COGM)Cost of Goods Manufactured (COGM) is a schedule showing the total production costs during a specific period of time. See COGM formula & examples in this guide. COGM is the total costs incurred to manufacture products and transfer them into finished goods inventory for actual retail sale, utilities, bonuses and commissions, and marketing expenses. Variable costs tend to be more diverse than fixed costs. For businesses selling products, the variable cost might include direct materials, commissions, and piece rate wages. For service providers, variable expenses are composed of wages, bonuses and travel costs. For project-based businesses, costs such as wages and other project expenses are dependent on the number of hours invested in each of the projects. Cost allocation is the process of identifying costs incurred, accumulating and assigning them to the right cost objects (e.g., product lines, service lines, projects, departments, business units, customers) on some measurable basis. Cost allocation is used to distribute costs among different cost objects in order to calculate the profitability of, for example, different product lines. A cost pool is a grouping of individual costs, from which cost allocations are made later. Overhead cost, maintenance cost, and other fixed costs are typical examples of cost pools. A company usually uses a single cost allocation basis, such as labor hours or machine hours, to allocate costs from cost pools to destined cost objects. 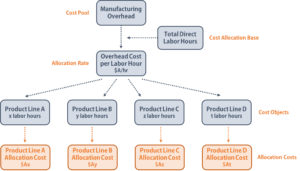 A company with a cost pool of manufacturing overhead uses direct labor hours as its cost allocation basis. The company would first accumulate its overhead expenses over a period, say for a year, then divide the total overhead cost by the total number of labor hours to find out the overhead cost per labor hour (the allocation rate). Finally, the company would multiple the hourly cost by the number of labor hours spent to manufacture a product to determine the overhead cost for that specific product line. To maximize profitsNet Profit MarginNet profit margin is a formula used to calculate the percentage of profit a company produces from its total revenue. The profit margin ratio of each company differs by industry. Profit margin = Net income ⁄ Total revenue x 100. Net income is calculated by deducting all company expenses from its total revenue which is, businesses must find every possible way to minimize costs. While some fixed costs are vital to keeping the business running, a financial analystGuide to Becoming a Financial AnalystHow to become a financial analyst. Follow CFI's guide on becoming a financial analyst - networking, resume, interviews, financial modeling skills and more. We've seen thousands of people become financial analysts over the years and know precisely what it takes. should always review the financial statements to identify excessive expenses that do not provide any additional value to core business activities. When an analyst understands the overall cost structure of a company, he/she can identify feasible cost reduction methods without affecting the quality of products sold or service provided to customers. The financial analyst should also keep a close eye on the cost trend to ensure stable cash flows and no sudden cost spikes occurring. Cost allocation is an important process for a business because if costs are misallocated, the business might make wrong decisions to overprice/underprice a product or invest unnecessary resources in non-profitable products. The role of a financial analyst is to make sure costs are correctly distributed to the destined cost objects and appropriate cost allocation bases are chosen. Cost allocation allows an analyst to calculate the per unit costs for different product lines, business units, or departments and thus, find out the per unit profits. With this information, a financial analyst can provide insights on improving the profitability of certain products, replacing the least profitable products, or implementing various strategies to reduce costs. Cost Behavior AnalysisCost Behavior AnalysisCost behavior analysis refers to management’s attempt to understand how operating costs change in relation to a change in an organization’s level of activity. These costs may include direct materials, direct labor, and overhead costs that are incurred from developing a product.